Recalls of consumer products are very common. Amongst the thousands of consumer products that are constantly monitored for safety issues, baby gear is amongst the items most commonly recalled. Part of the reason for frequency of such recalls is the fact that safety standards change regularly when it comes to baby products. However, just as often faulty manufacturing is the cause of baby gear recalls. In 2014 and 2015, more than 5 different child seats were recalled for safety issues. The dangers posed by these issues ranged from allowing children falling from seats to entrapment. In fact, many of the brands that were recalled were ones that were well-known and trusted. In November 2014, Evenflo announced a recall of its Embrace 35 rear-facing child seat, manufactured from December 2011 to May 2013. With over 202,000 affected units, this recall proved to be massive. The issue was that the buckle became increasingly difficult to unlatch with time. This posed a risk of entrapment if a child needed to be removed from a vehicle quickly in the face of danger. Evenflo provided a remedy kit with instructions for correcting the issue to all seat owners and will even provide a replacement buckle to those with models of the Embrace 35 that have not been recalled. If you have questions about whether your seat is affected, you can check the company’s website www.embracebuckle.evenflo.com or call them at 1-800-490-7591. In July 2014, Graco – another big name in baby gear – was the focus of a huge recall of almost 4 million rear facing carseats. The National Highway Traffic Safety Administration (NHTSA) deemed the seats a risk for entrapment for the same reason as the Evenflo seats. 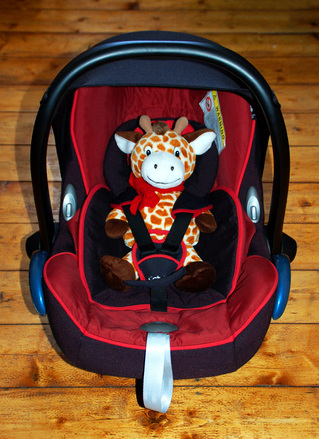 To learn if your car seat is affected check the website: https://secure.gracobucklerecall.com/Recall2014. In addition to car seats, other types of child seats pose safety risks. The Mima Moon 3-in-1 High Chair was recalled in February 2015. This product had only been on the market since May 2014, when the Consumer Product Safety Commission (CPSC) discovered that it was a fall and impact hazard. Only 1000 units were affected in this recall. A new baby seat that has only been on the market since September 2014 was recalled in May of this year. The OXO Nest Booster Seat was recalled by the CPSC when a potential fall hazard was detected. This recall involves 30,000 items. With 16 million units affected in 60 different recalls in the Carseats/Child Seats category from 2005 to 2015 and four million units from 20 different recalls in the High Chairs & Boosters category from 2005 to 2015, there is a real risk that a product you have may have a safety issue. These astounding numbers are worrisome, because not everyone pays attention to recalls. Many of these products are likely still in use or in storage waiting to be used again. Awareness of the safety issues posed by child seats that we trust are the key to keeping children safe. The National Highway Traffic Safety Administration Vehicle Safety Hotline, 1-888-327-4236 (TTY 1-800-424-9153) or its website www.safercar.gov can provide more information on child car seat recalls. Regularly checking recalls through recalls.gov will ensure that you are up to date on high chair and booster seats, as well as other baby gear products.